Maps from the official City of Toronto Plan. Alex Legum, coordinator of active living programs at Evergreen, is excited about the new separated path on Bayview. Evergreen Brick Works runs dozens of programs and events a year that focus on sustainable city building. Their activities and events range from making school grounds more green to improving city green space in the city. Now there will be a safer way of accessing it in one of the most sustainable modes of transport possible: cycling. 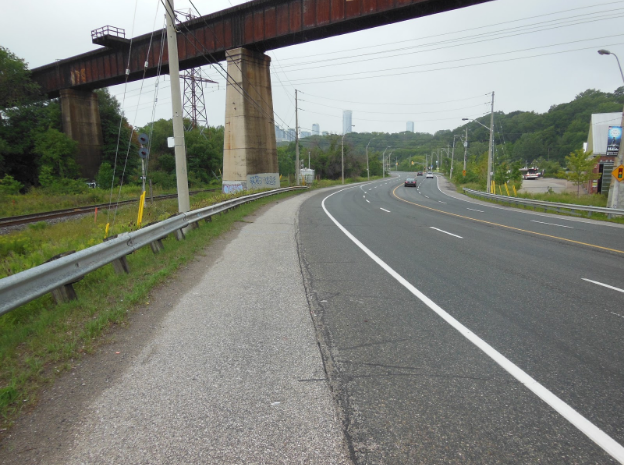 The trail will be on the east side of Bayview, and will connect the Brickworks (right) to the Lower Don Trail. The Bayview multi-use trail is part of a larger project known as the Lower Don Trail Access Improvements. Part one of these improvements includes six other projects along with the Bayview bike lane. 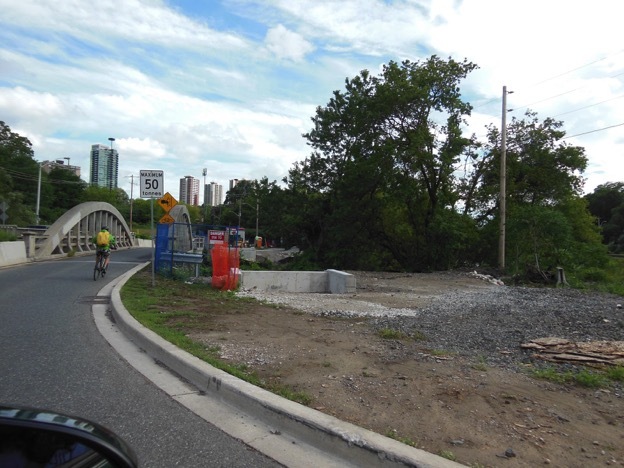 The other projects are: Pottery Road bridge and connection, condition audit and surface improvements of the Lower Don trail, The Narrows widening, staircase access to Dundas and Gerrard, and an art fence along the way. Consultation for this project began in 2013, and construction for the multi-use trail is scheduled from August 2 (although as of August 16 construction had not yet started) to November 30, 2016, weather permitting, as part of this larger group of Bayview improvements. 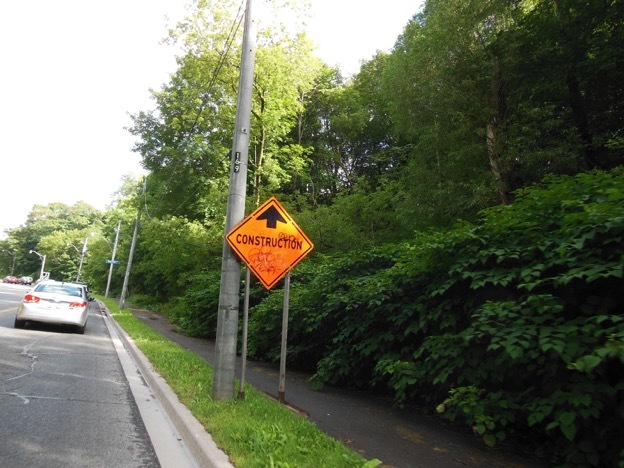 The trail begins construction this week, and pylons are already set-up along the entirety of Bayview down to Rosedale Valley Road. Currently riders have to ride on a wide paved shoulder next to cars hurtling at 70 km/hr. 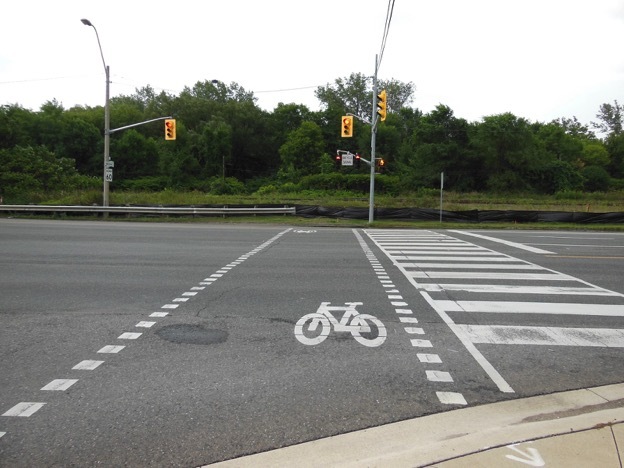 The design features a two-way pedestrian and cycling roadway on the east side of Bayview that is separated by a metal and wood “guide rail.” Previously, riders were forced onto paved shoulders to get to the Brickworks, and would have to sidle up to cars driving at 70 km/h. This multi-use trail will provide continuous access from Pottery Road to Rosedale Valley Road. The lanes will not go as far as Leaside, but a 1-km-long paved shoulder will run from Bayview to Nesbitt Drive to Pottery Road. There is also access to Crothers Woods Trail at that point, should you want to take a route that does not require biking on a road with motor vehicles. 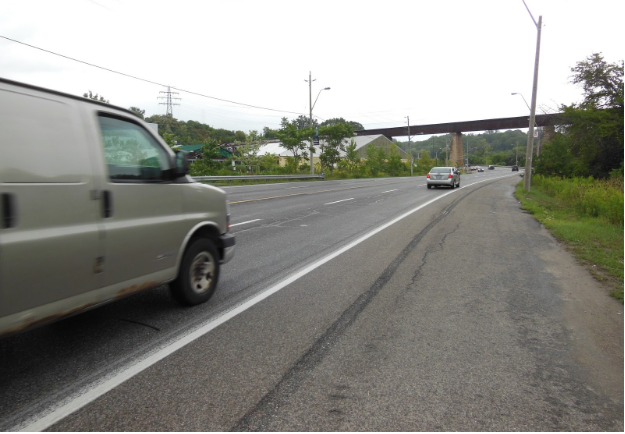 Removal of the right-turn channel at Rosedale Valley Road will allow for easier access to the Rosedale Valley Trail. The Lower Don Trail is a major recreational cycling trail that hosts many commuter cyclists as well. It’s part of the Pan Am Path, an 82-km recreational trail that spans Toronto, including some suburban areas. While Toronto can’t really boast a true cycling network for utilitarian cyclists in the city, recreational trails have often been promoted and well looked after (in the summer anyway), and well-used too. According to Jacquelyn Hayward Gulati, Acting Director of Transportation Infrastructure Management, linking recreational trails with commuter lanes is an important part of the 10-year cycling plan. She worked on integrating the two when she was manager of the cycling unit in the city of Mississauga, and is seeking to marry them together in Toronto as well. The multi-use trail will connect to the Evergreen Brick Works at this intersection that already features lights for cyclists and pedestrian. While it is crucial that the city make cycling infrastructure more of a priority to reduce gridlock and improve health and safety for its citizens, it’s also important that we celebrate recreational trails like the Lower Don Trail when trying to foster a community of cycling. 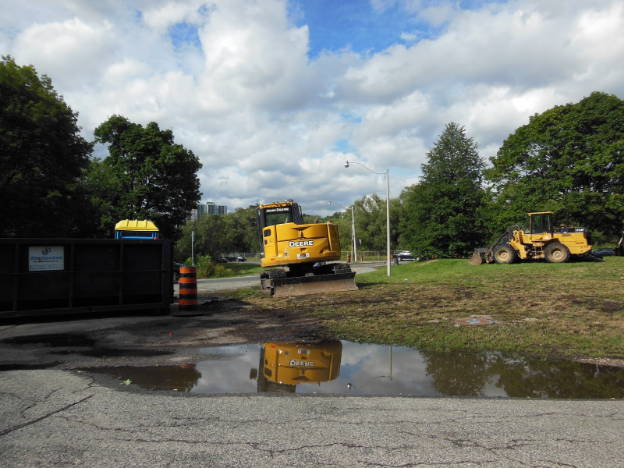 Construction for the bridge connecting Pottery Road to the Lower Don Trail and the multi-use trail on Bayview has already begun. There are plans for the Bayview multi-use trail to eventually link with the Wellesley bike lane, but there are no plans to link it with the River Street bike lane. Because the trail links the Lower Don Trail to the Brick Works, this also means it will connect to the Beltline Trail. New access points to the Lower Don Trail at Gerrard and Dundas will be via stairs. 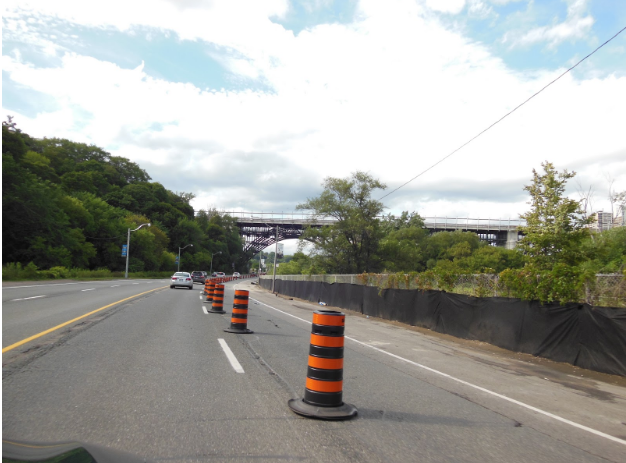 It’s a good start to have a separated multi-use path on the 2.6 km stretch of Bayview that connects the Lower Don Trail to Evergreen Brickworks, but there is still much more to be done to make the large, north-south artery truly accessible and safe for all modes of transportation. Despite its drawbacks of only connecting unlit trails, this 2.6 km Bayview multi-use trail links two major off-road trails and provides safe passage to a major Toronto destination. It will be beneficial to both recreational and commuter cyclists alike. What about those looking to travel north on Bayview? 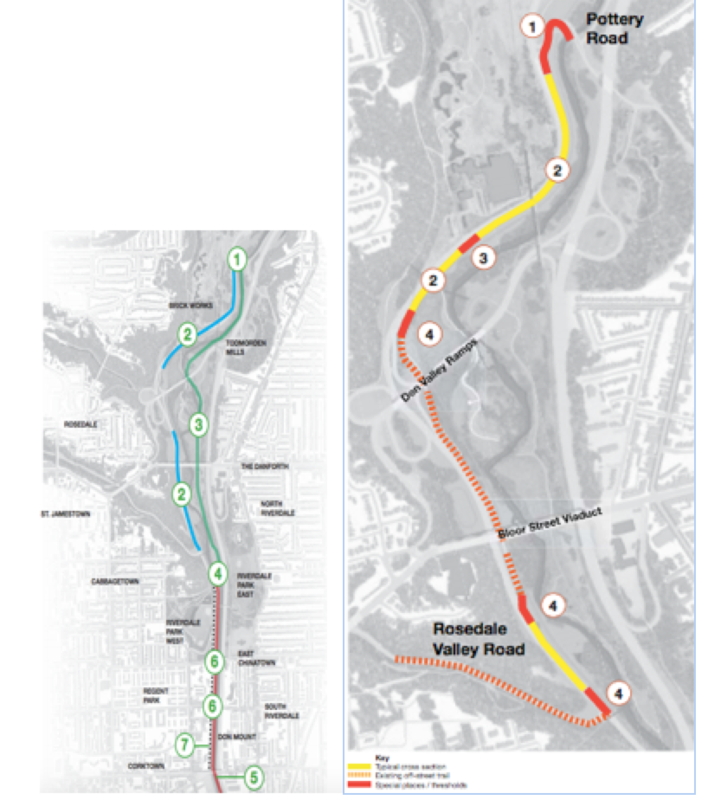 They'll have to rely on the Don Valley Trail until the next 10-year-cycling plan comes along. For up-to-date information on the Lower Don Trail construction, closures, and access improvements go here. Our new issue of dandyhorse has arrived! dandyhorse is available for FREE at Urbane Cyclist, Bikes on Wheels, Cycle Couture, Sweet Pete's, Hoopdriver, Batemans, Velofix, and Steamwhistle.Our new issue of dandyhorse includes cover art by Kent Monkman, interviews with Catherine McKenna and the women behind Toronto's first feminist bike zine, lots of news and views on Bloor, Under Gardiner and the West Toronto Railpath and much, much more! Get dandy at your door or at better bike and book shops in Toronto.